Firstly, merely in terms of landscape, it has everything from dazzling seascapes, towering mountains and magnificent cities to magical fairy-chimneys and vast, unending plains. Just to sit on a bus and travel around Turkey is a pleasure in itself. The sheer variety and vastness of the landscape induces a kind of incantation. And outlined against the azure of the mediterranean sky, the trees, the fields, the mountains and forests radiate with an intensity of colour we can only dream of in Northern Europe. It is also not an understatement to call Turkey the cradle of civilisation. The importance of sites such as Troy, Hattuşaş, Pergamon and Efes is well-documented, but following recent archaeological excavations at Göbekli Tepe, it is now no exaggeration to say that civilisation in Turkey stretches back at least to the 10th millenium BC. 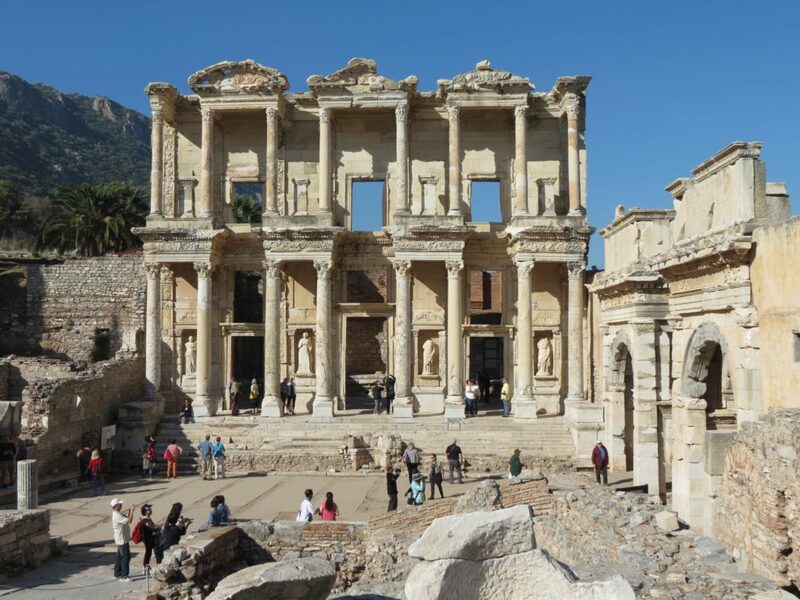 One of the first things that strikes the visitor to Turkey is the sheer abundance of archaeological sites, many of them barely excavated, such that the visitor has the feeling almost of being their discoverer. But this is only to scratch the surface of experiences in Turkey and one should not, of course, forget Turkish cuisine. With its origins in a fusion between Ottoman and Mediterranean cuisine, the modern Turkish kitchen table is a feast for all the senses. There is an abundance of vegetables – aubergines, tomatoes, peppers – which all bring colour to the dishes. But these are contrasted with healthy staples – breads, rice and beans and complemented with delicious meats and dairy products: in particular yoghurts and cheeses. Such are the impressions that greet the visitor to Turkey. But the overriding memory so many visitors take home with them is the sheer friendliness and ebullience of the people. It is indeed hard to call to mind a more welcoming people.